The past year in Israel, but especially in Jerusalem, has been horrifying. First there was the kidnapping and murder of three Jewish young men on their way home from school, then Operation “Protective Edge”, then the murder of an Arab teenager by a Jewish gang, and then an unleashing of racism and violence–sometimes deadly–coming from both sides that included an the attack on a synagogue in Har-Nof, Jerusalem. At times I ask myself why I am still living here. And then I think of People like Pastor Josh Thomas. Josh is the executive director of Kids4Peace. I met Josh when I was about 15 when I was volunteering at a summer camp with Kids4Peace. After being a camper in 2004, when I was ten years old, I decided to come back as a shepherd (counselor). Josh has been an inspiration to me since that summer. I now work for Kids4Peace and am a “Jewish Faith Advisor” for the “Leap” group, which is made up of kids in seventh grade, participating in the second year programming of Kids4Peace. This year we have about 50 kids participating, a nearly 100% continuation of the kids from the year before. The Kids4Peace community has grown to 1,800 participants, staff members and volunteers. True to their commitment to “faith in peace,” Kids4Peace children and staff demonstrate great courage in the midst of conflict – refusing to be enemies, choosing to be friends. If anyone can bring peace to the world it is people involved in projects like this one. My interview with Josh was scheduled for 6pm Jerusalem time. I sat at my computer for a few minutes before Skyping him. I saw a post on FaceBook about a recent attack in Jerusalem, I decided to add a question to my list. Dealing with Jerusalem and peace right now is like playing with fire. So, why focus your work on Jerusalem? I then proceeded to call Josh on Skype. “The situation here is all very upsetting, What motivates you to keep going?” I asked. His answer is a good example of why I find him inspiring: “I realized that we are Creating a community. We are Motivating people to set an example of social change”, he says. “That is what keeps me going. Nowhere else do I know of a place where people of such different religious and political beliefs can come together”. “Peacemaking and peacebuilding are not foreign concepts to me. I grew up in an environment where this was always talked about. But you didn’t grow up with it. So what inspires you to become apart of this movement of social change?” I asked him. “So when did you become an Episcopalian Christian?” I ask. “And how did all these things–social change and the Church–come together?” I ask. I feel that way too. This past summer Josh came to visit us at camp for a few days and I stayed up with him until late at night discussing all sorts of faith based issues both in Kids4Peace and my personal life. 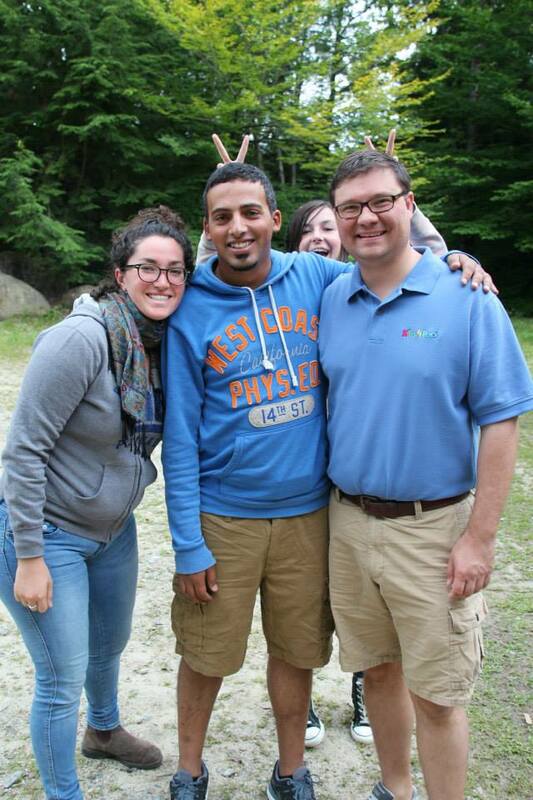 Not only do I see Josh as the spiritual leader of Kids4Peace, but he is definitely one of my personal spiritual guides as well. What I love about Kids4Peace is that we are not asking people to give up their faiths to work towards peace; rather, we want them to work on peace together. “Bringing together peoples’ hopes and dreams with the practicality of their own religion. This is definitely a main goal of ours at Kids4Peace,” Josh explained to me. Sometimes in living in a country where reading the news and hearing about a faith, or cultural based violent attack becomes a “normal” thing, you begin to ask questions, Have we made an influence? Have we made a change? Josh then surprises me with a quote not from the New Testament or the Gospels, but from my very own Rabbi Abraham Joshua Heschel. “Religion’s task is to cultivate disgust for violence and lies, sensitivity to other people’s suffering and the love of peace”. “Our religions are different. If we want to get beyond ”Kumbaya” and “Hummus”, we have to understand that we are stepping into the world of radical differences. We have to think hard about what we are willing to sacrifice. What are we willing to compromise? At the end of the day, we may not have the same concerns but we just have to — DIVE IN! I want to thank Josh for inspiring me and opening so many doors in the world of social change. I believe, like Josh, that slowly we are on the path to success.